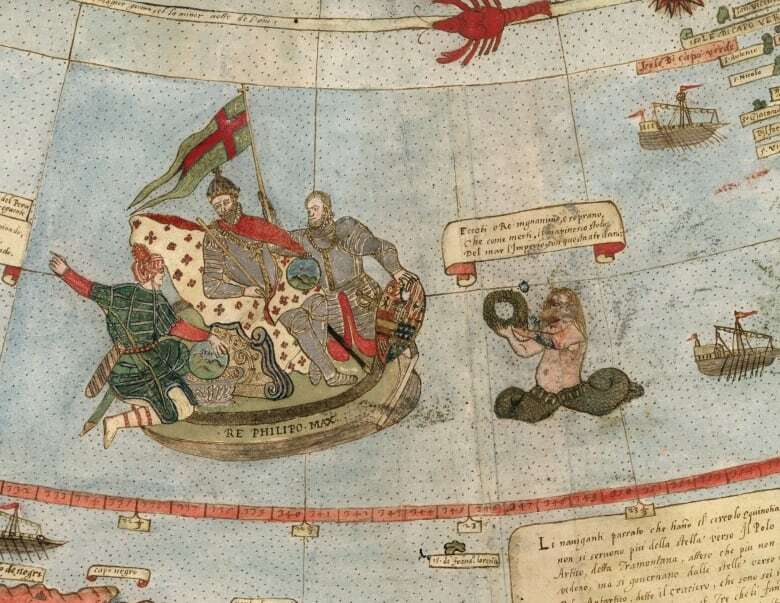 An extremely rare and massive 16th-century map has been been fully assembled and digitized for the first time ever. 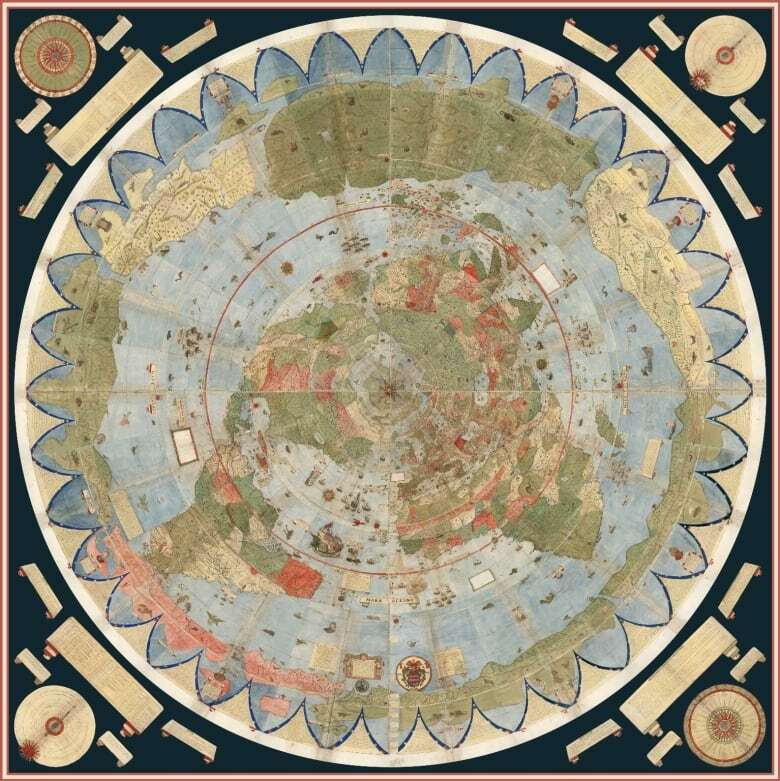 "It's the largest map of the world made during the Renaissance, you know, at the dawn of the modern age," map collector David Rumsey told As It Happens host Carol Off. The three-by-three metre map, brimming with mystical beasts and elaborate drawings, was created in 1587 by little-known Italian geographer Urbano Monte. 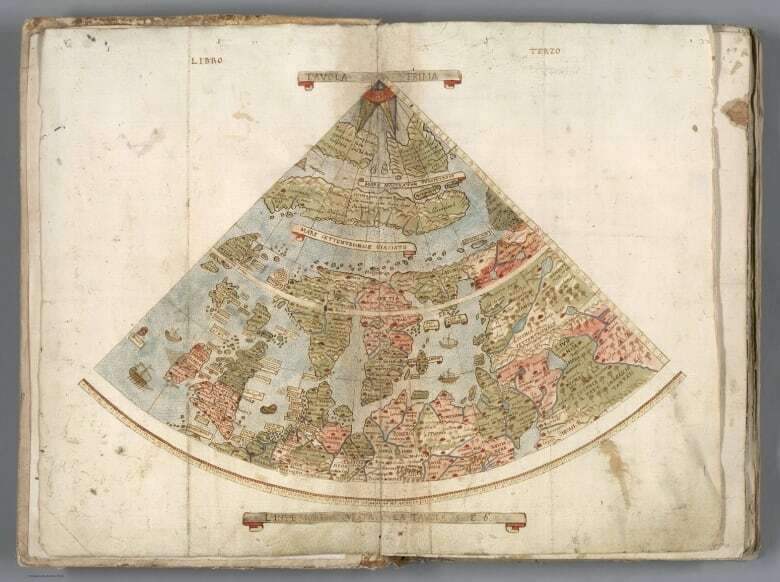 For centuries, the only known copy consisted of 60 individual pages bound together in an Atlas preserved in a small Italian library. At least it was, until Rumsey found and purchased another copy and set about having it digitized and assembled. 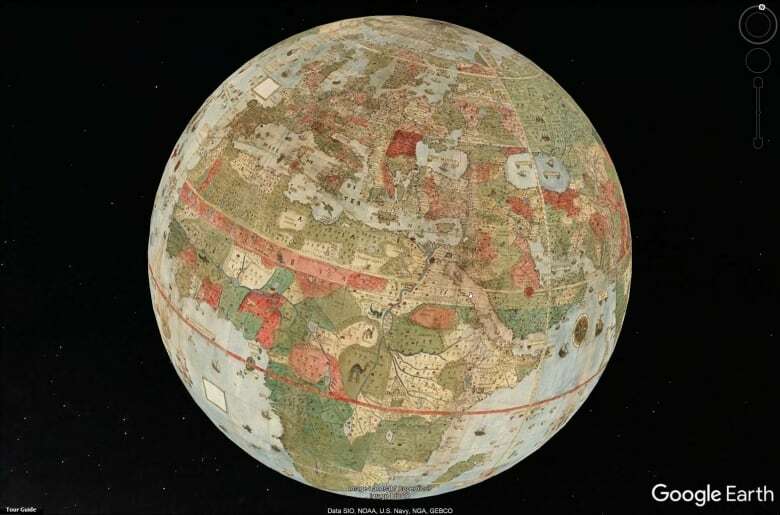 Now the complete map and all 60 pages can be perused online at the Stanford University's David Rumsey Map Center website. "It's just an extraordinary map," Rumsey said. "It's never been seen before in its 10-by-10 foot glory." Monte was a wealthy socialite from Milan who dedicated his life to learning, writing and teaching about geography. In many ways, his map was more detailed and accurate than those created by his more highly esteemed colleagues, Rumsey said. "It's quite far reaching and ahead of its time for 1587." He left detailed instructions for how to assemble his pages into one giant map, but it was never published in its complete form. "I think he'd be very pleased. People are really just amazed by the map. It really speaks to them. It has so much of his personality," Rumsey said. "It's all hand drawn, hand lettered, so it's a very personal kind of product." Monte's map was designed 18 years after Gerardus Mercator created the map that's still used today on smartphone apps and in most classrooms. 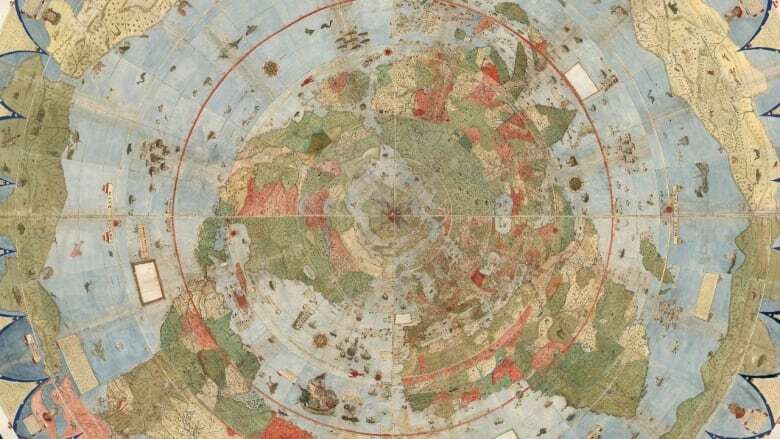 But unlike the Mercator projection, Monte's map shows the world from directly above above the North Pole — a perspective now known as the north polar azimuthal projection. "The projection is just extraordinary for that time," Rumsey said. The Mercator projection has been criticized in recent years for its Eurocentric depiction of the world that distorts western and northern regions to look bigger than they actually are. "I think he felt that it was a more accurate view of the world, which many would agree with today, than an Mercator projection," Rumsey said. Still, any map that isn't a globe will contain some distortions. While the north polar azimuthal projection more accurately represents most continent, it dramatically enlarges the antarctic, Rumsey said. "I think he loved that because that was the really unknown part of the world and it enabled him to populate it with all his fantastic monsters and beasts and so on," he said. 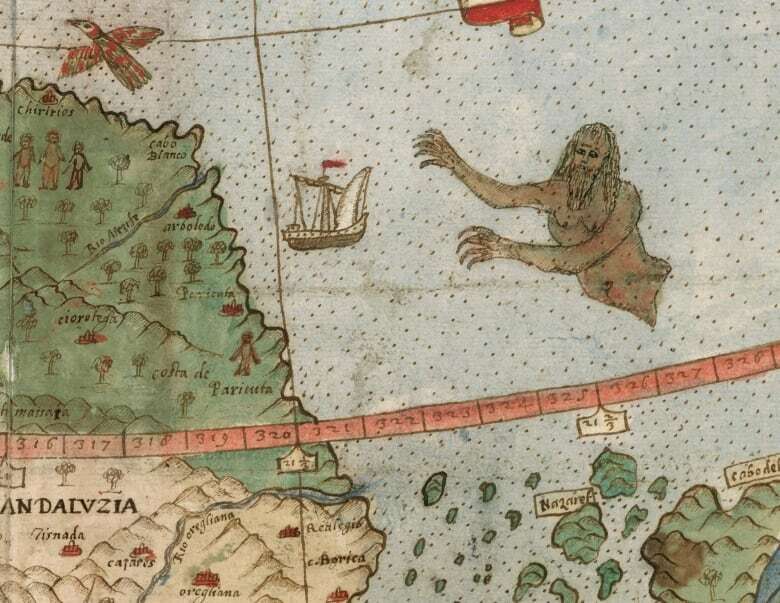 Monte's map has no shortage of fantastical creatures and artistic embellishments. There are mermen and sea monsters and great big ships. There are also detailed renditions of kings and other historical figures. Mapmakers of Monte's era "didn't like empty spaces," Rumsey said. "There were many places that they did not know the names of towns and locations, so they filled them up with trees, monsters. They just used it as a palette, and it's so artistic and interesting that it just, it grabs us today," he said. Another thing that make Monte's map so social, Rumsey said, are its detailed annotation describing geography around the globe as it was understood at that time. "It's more than just a map," he said. "It's a whole scientific instrument."